2018 has been a standout year in Ontario for mycotoxins like DON in corn. As of Nov. 9, 1,300 producers have called Agricorp to report damage to grain corn due to deoxynivalenol (DON). Agricorp is an Ontario organization delivering risk management programs to the agriculture industry and is currently asking its customers to collect and document DON samples, tests and rejections to quantify the loss and support any claims. 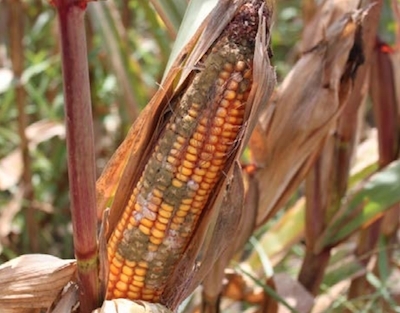 Ontario’s 2018 Grain Corn Ear Mould and DON survey found 60 per cent of samples tested low for DON, a increase from last year. Around 25 per cent of all samples have a DON concentration of five parts per million (ppm) and greater, and some producers have been reporting even higher levels, making 2018 a standout year for DON in corn. The majority of damaged acres are being reported in southwestern Ontario in areas such as Middlesex, Elgin, Huron and Lambton. At this time, customers and buyers are reporting that DON levels of five ppm to eight ppm are being purchased, according to Agricorp’s 2018 corn crop update. But buyers are holding off on purchasing corn with higher DON levels until harvest progresses and these volumes are understood. Agricorp is encouraging corn producers affected by DON to contact Agricorp to report the damage because DON is covered by production insurance. Agricorp has published a host of resources for producers, including Understanding Coverage for DON Grain Corn, which discusses options for production insurance customers affected by DON, and information to help farmers make decisions about DON. Corn yields for 2018 are expected to be above average, and these higher yields can offset low-yielding fields that are impacted by DON. Agricorp says that the overall high corn yields to offset DON losses may mean not all production insurance claims will result in a payment. Any claim must be finalized by March 2019 to avoid further DON development in warmer temperatures.